OH. Hell. No. What in the hell.....WTF? Huh? These are my TWO favorite anchors and I am a bit disappointed with MSNBC for their removal. At any rate, Bill O'Reilly, FOX news, and the Republicans prosper. Wow. Thoughts? The lovely Rachel Maddow smokes bofe-a-deez busters. Been my favorite MSNBC personality ever since she neutered that blowhard sack of hot wind Joe Scarborough - and - his troglodyte sidekick Pat Buchanan. What you think about her new show? This was only a matter of time. I'm left leaning and even I was embarrassed by their obvious bias. 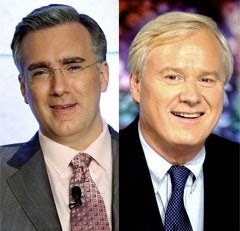 If Fox gets criticised for its bias --and it should-- MSNBC is up for criticism, also. I think they did the right thing. Mean while that swine called Fox rides off in the sunset? MSNBC just lost all street cred. there has been a left leaning biased in the media for the last year. big surprise. it's only recently that i have noticed it letting up a little. i am disappointed by this decision noetheless.